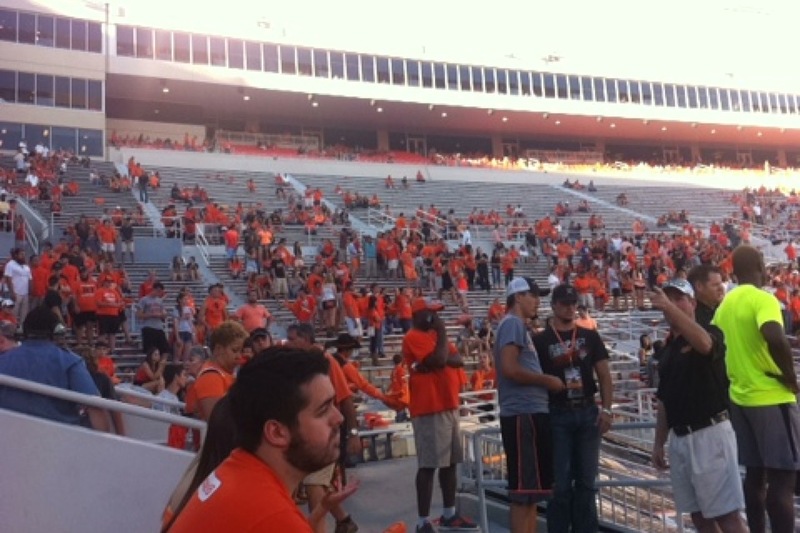 Down just 10 with about four minutes to go, fans began to head for the exits at Oklahoma State’s Homecoming game against West Virginia on Saturday. Spreads were not close at all in the Big 12 on Saturday. After the announcement of Homecoming award winners, the student section began to look like this. While this was not immediately after halftime, this is still pathetic. How can any of us claim this is truly America’s Greatest Homecoming Celebration or the loudest stadium in the Big 12 as it’s been labeled multiple times, when we don’t stay for the end of a loss in a year where OSU honestly wasn’t expected to do much. This shouldn’t happen in sports, not just collegiate. During the game, social media addressed it as a battle between fraternities and sororities and those who don’t participate in the Greek community. It’s not any one group, but rather the majority of the student body. Also, before I start getting into football, I just want to give a huge shoutout and thank you to the crew of ESPNU’s Road Trip. Hosts Jordan Echinblatt and Rayven Tirado were in Stillwater this weekend with the rest of the crew. After observing their filming on Thursday night, I was invited to observe and help out on Friday. I learned a ton from you guys and had a blast doing it. Thank you all so much. With the attendance aside, the game was a little boring. West Virginia jumped out to a quick 14-0 lead and the Cowboys were never able to catch up. Daxx Garman’s play left more than a few fans wondering if Mike Gundy would waste Mason Rudolph’s red shirt, or if they would see Taylor Cornelius come off of the bench. Clint Trickett looked just as solid as he has all season. While West Virginia is looking great heading into their College Gameday showdown with TCU in Morgantown, Oklahoma State needs to be worried. The offense looks dismal and fans are calling for Mike Yurcich’s dismissal from the staff. Bill Snyder might just be licking his chops in Manhattan. Speaking of Kansas State, they looked awful on Saturday against Texas. The sad thing is that Texas was still worse. This game was frustrating to watch because it was so poor. Both teams would get the ball in good field position and fail to do anything with it. Jake Waters actually ran the ball. It was kind of like watching Davis Webb against Oklahoma State, it might have made you scratch your head going, “he can run the ball?” If Kansas State can win while playing this bad, Mike Gundy must be worried. TCU wins 82-27 vs Texas Tech tonight. TCU basketball scored over 82 points only once last season (98 vs Grambling State Dec. 19, 2013). No. 19 Oklahoma over Iowa State – Oklahoma is a talented team and the Cyclones just don’t match up well. Look for Trevor Knight to recover from the last three games on Fox Sports 1 at 11 a.m.
No. 10 TCU over No. 20 West Virginia – This game will be a shoot-out, no doubt in my mind. What this comes down to, is the fact that Dana Holgerson is a very Mike Leach-esque coach in the “I don’t care how many points you have as long as I have more” mentality. Gary Patterson on the other hand is very defensive minded and TCU’s defense outmatches WVU’s. This game is at 2:30 on ABC. No. 12 Baylor over Kansas – I almost feel like I don’t need to put anything on this game. But Baylor is furious after losing to West Virginia and Kansas is so far below the level of the rest of the conference, that this game shouldn’t be close. They travel to Waco on Fox Sports 1 at 3 p.m.
Texas Tech over Texas – The Red Raiders should get their second conference win in a game that sold out at the very beginning of August. Texas is bad, but they are even worse away from Austin. This game will kick off at 6:30 on Fox Sports 1. No. 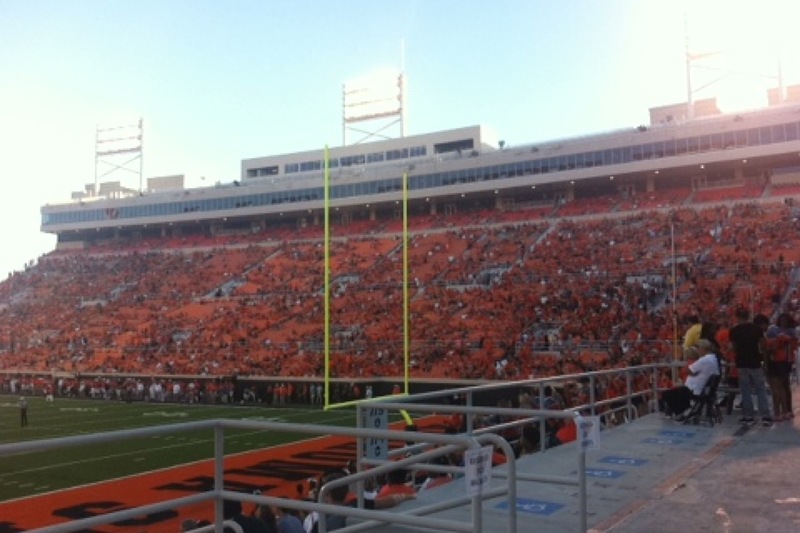 11 Kansas State over Oklahoma State – Oklahoma State has looked bad at times. The best hopes for the Cowboys to become bowl eligible is to beat Texas in Stillwater on Nov. 15. Kansas State has proven that they can win even after playing just horribly. Kick is set for 7 p.m. on ABC.